Wow! You all are going gangbusters on the Best of 2011 Assignment with over 20 submissions so far. There is still time to join in. Like some have done, I will be splitting up mine into two posts. This one will feature my Disney photos. I encourage you to follow the links added for more photos and details. I visited Walt Disney World twice this year and went on a Christening Cruise of the Disney Dream cruise ship. I took thousands of photos and it was a chore to whittle them down to a select few. The first set is from January and not great technical photos. Instead, I choose them for what they mean to me. I’ll explain below each photo. Introduction of the "The Magic, The Memories and You!" castle projection show during the "Let the Memories Begin" press event in the Magic Kingdom at Walt Disney World on Tuesday, January 18, 2011. Nikon D700/28-300VR, 1/5s, f/4, ISO 6400, EV -0.7, 40mm focal length. As part of the January trip, I attended the very first presentation of the new The Magic, The Memories and You! show in the Magic Kingdom along with other media. The show really needs to be seen to be appreciated. To see the castle used as a giant projection screen mixed with music, photos, animation, video and even the voice of Walt Disney gave me goosebumps. The Golden Mickeys is one of the Broadway-style shows presented in the Disney Dream's Walt Disney Theatre. Nikon D700/28-300VR, 1/125s, f/4.5, ISO 5600, EV -1.0, 56mm focal length. 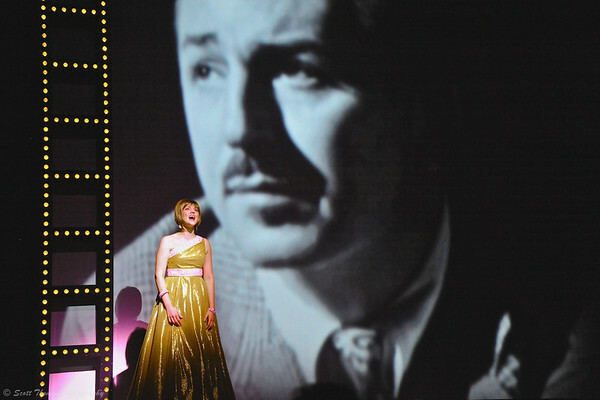 As much as I enjoyed exploring the Disney Dream and spending a day at Castaway Cay, Disney’s private island, it was the wonderful Broadway-style shows presented in the 1,340 seat Walt Disney Theatre which was a most pleasant surprise. The talent was even more so than in the parks. The shows were funny, full of Disney characters and emotional via songs and story. Photographers Bob Desmond, Matt from Australia and Scott Smith on Main Street USA in the Magic Kingdom. Nikon D700/28-300VR, 1/250s, f/11, ISO 200, EV 0, 28mm focal length. As much as I loathe the It’s A Small World theme song, I have to admit how right it is. After the Disney Dream cruise, I hosted a photowalk on Main Street USA in the Magic Kingdom. 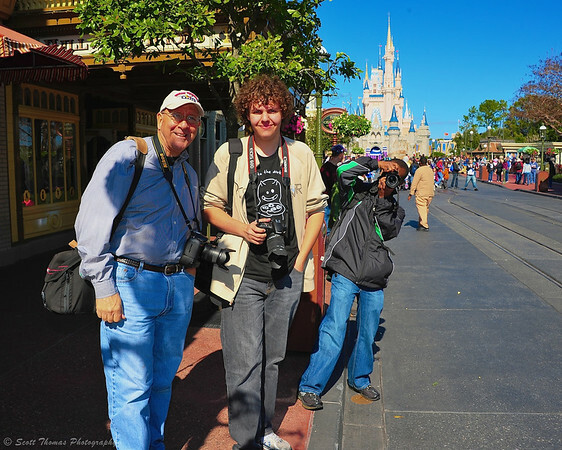 Over the past few years, I have enjoyed the friendship of many Disney loving photographers and none more than Bob Desmond who has done freelance photography for Walt Disney World for over 20 years. Scott Smith is a very talented Orlando flickr photographer who loves to find the Human Element inside Walt Disney World. The young photographer, Matt, was visiting with his family from Australia. I learned about Matt from his mother who contacted me via the blog I write for AllEars.net called Picture This! Matt had just gotten his dSLR camera and she hoped I could help him before their trip. Not only could I help, I could meet them! In fact, we enjoyed meeting Matt’s family the night before at a restaurant. Yeah, it really is a small world! The next set is from my trip last month where I set out to challenge myself to get some photos I have wanted to attempt. 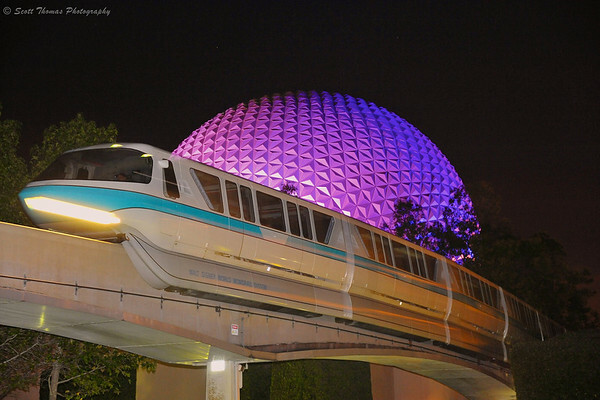 Monorail Blue entering Epcot at night past Spaceship Earth in Walt Disney World. Nikon D700/28-300VR, 1/4s, f/5, ISO 3200, EV 0, 82mm focal length, rear-sync flash. Here I am lighting up Monorail Blue as she quietly moves past Spaceship Earth in Epcot. I had seen others do this kind of shot and pretty much was determined to do it myself. It took two monorails before this one before I was satisfied. I will be writing up a blog post about the technical aspect of this photo in the near future. Barn Owl (Tyto alba) launching into the air during the Flights of Wonder show in Disney's Animal Kingdom. Nikon D700/28-300VR, 1/1000s, f/5.6, ISO 3600, EV 0, 300mm focal length. Catching a bird in flight is never easy. 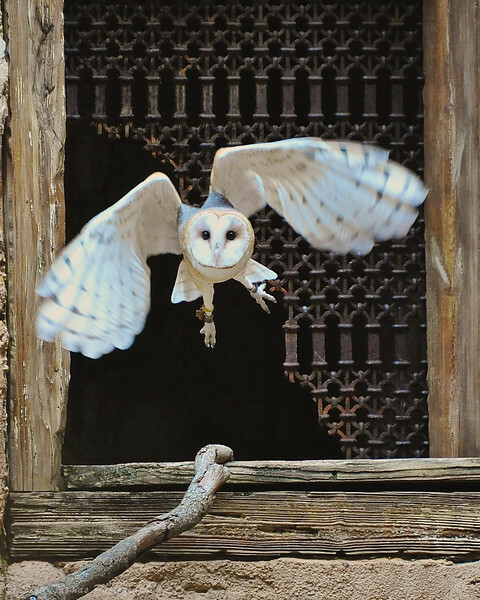 The Flights of Wonder show at Disney’s Animal Kingdom does help increase the odds as they tell you this Barn Owl would be launching to fly to the back of the theater. They even pick a great background for the light colored owl. Pirate skeletons playing a never ending game of chess in the queue for Pirates of the Caribbean attracion in the Magic Kingdom. Nikon D700/50mm, 1/20s, f/1.8, ISO 6400, EV +0.3. 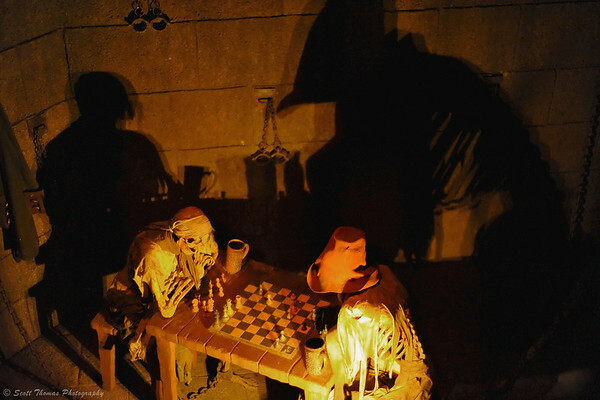 You have to take the right side queue in Walt Disney World’s version of the Pirates of the Caribbean attraction to see this scene of two skeleton pirates deadlocked in a game of chess. The lighting is low and yellowish. To photograph it I used my Nifty-Fifty, the Nikon 50mm f/1.8 lens, and pushed my camera’s ISO to 6400. Even then, the shutter speed dipped to 1/20th of a second. Normally the queue is packed with people but I hit a less busy time just before a Mickey’s Not So Scary Halloween Party so I was not being bumped into by other guests as I took lots of photos. This was my favorite as I accentuated the shadows on the cell walls. This entry was posted in Assignments, Travel and tagged 28-300mm, barn owl, bird in flight, blue, cinderella castle, dcl, disney dream, epcot, flash, flights of wonder, florida, future world, magic kingdom, monorail, nikon D700, orlando, pirates of the caribbean, rear-sync, skeleton, theatre, vr, walt disney world. Bookmark the permalink. So do I. 🙂 Now, I want to photograph one in the wild. There’s some really excellent work here, Scott. That monorail shot was not easy, and I love the first two as well. 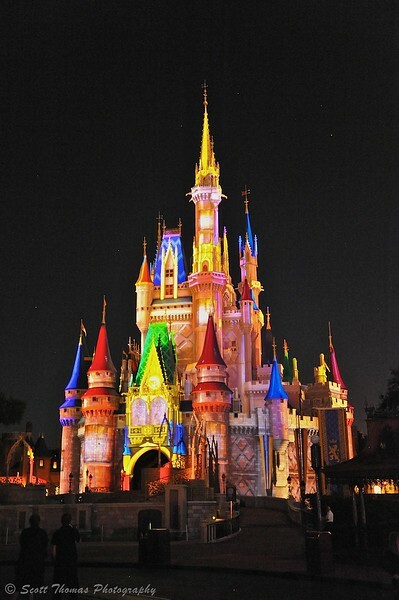 I have never seen an image of the Castle as colorful as yours. The performer being watched by Walt Disney is an excellent composition, and I’m with you on the value of the accentuated shadows in the “Pirates” shot. Thank you, Larry. The Castle photo is only one projection in a slew of them during the show. It is amazing to see. The shadows is what makes this scene so cool. Some trivia, the chess pieces are set up in a way any move would result in a checkmate. Thus, they never make a move. I’ll have to check out ‘Flights of Wonder’ again. It was always one of our favorite shows. They have changed out the owl…used to be a dark brown one. I agree…the white one pops off that background! I have seen this show on my last three trips and have seen a lot of different birds being used. I did not get a good shot of a bird flying over the crowd. They fly so darn low. One even brushed my head with it’s wing as it flew by. These are wonderful choices Scott! I think I am echoing everyone when I say I love the owl shot. Way back when in once upon a time time, there was a snowy owl that lived in a snag off the dirt road I would travel to Zan’s house…scared the bejeezers out of me when it would swoop down on my car in the dark night in the middle of nowhere. If only I had been a photographer back then! If the winter is hard, sometimes Snowy Owls are seen around the Syracuse airport as the open fields are perfect hunting grounds for them. I looked into doing some photo tours to photograph them but they are expensive. Because I ran out of time so am taking teacher’s privilege this time. 😀 Nope, not going to Disney until next month, KD. I love all your shots, but what fascinates me the most is the Pirate skeletons shot. The skeletons look lifeless and the ghostly shadows really bring out the life in the photo. That’s what I thought to, Nye. Thank you for you continued support of my blog! It´s a very good shot of the owl, I agree. It must have been difficult to choose among the many Disney photos you have? You did a good job, every photo represent its own side of being in Disney world. Your photos make me feel like visiting this happy place one day. The magic castle…what a lovely mix of colors! You do have a Disney park which is much closer to you near Paris. One, I hope to visit one day. I feel I was there, visiting Disney Park, as I looked at your pictures. What extraordinary colours and patterns in the castle and monorail pictures ! I also love the human touch with the encounter of your friends. This pretty owl seems to be flying right at you, what a great shot ! Thanks for this assignment and for your pictures.